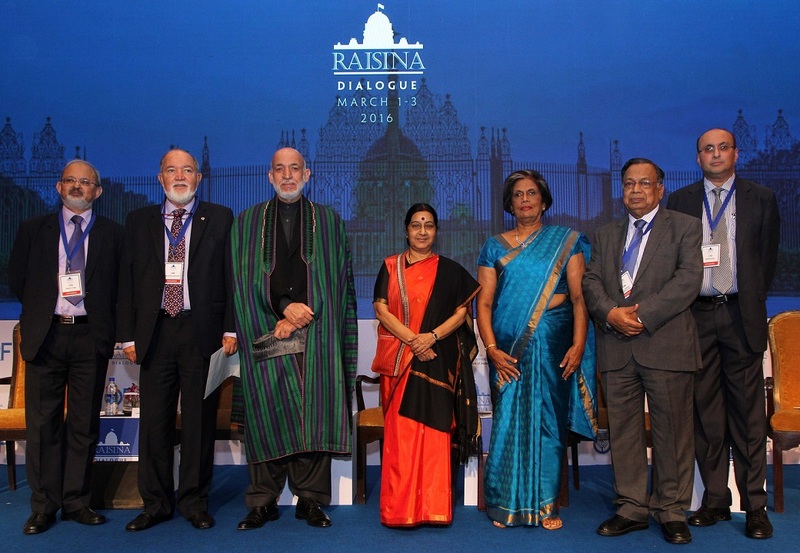 On January 17-19, 2017, New Delhi once again hosted Raisina Dialogue, a large-scale international conference. Over a relatively short period, the conference has not only clearly become a tradition, but has also become one of the most important meetings on international affairs on the global calendar. The conference became a tradition in March 2016, when the first forum took place on Raisina Hill within the very same government office premises that were designed by well-known English architect, Edwin Lutyens, in the Indian capital. It was organized by the Ministry of Foreign Affairs and Observer Research Foundation of India, based on the Shangri-La site in Singapore that is patronized by the London-based International Institute for Strategic Studies (IISS). Unfortunately, this event was poorly covered by the media. Meanwhile, the meeting was attended by members of India’s top government agencies, key partners in the region, representatives from Europe, Asia, and the USA, scientists, and flag officers – a total of about 120 foreign delegates from 40 countries. The participants of the event, the venue for this ambitious forum, and a varied programme under the slogan “Asian Connectivity” clearly demonstrated Delhi’s serious intentions to strengthen ties with the global community by public diplomacy, and develop a unifying idea on global and regional problems. This fact may and should allow India to develop and strengthen its position as of a regional leader, for a country that is striving to attain the status of a global power. Raisina Dialogue-2016 was focused on finding ways to establish cooperation in Asia through large-scale open consultations or unilateral decisions. In the absence of a coherent security architecture on the continent, and amidst the increased tension in the Indian Ocean region, which surely concerns both India and other seaside countries, this is very important. There are a few reasons for that. Firstly, a steady active advancement of China to the Indian Ocean (IO) through the introduction of submarines, including nuclear ones, the construction of a military base in Djibouti within the framework of the “pearl thread” strategy, and the creation of support points in Pakistan, Myanmar, Sri Lanka, Seychelles, etc., the conversion of the Chinese squad ships fighting with the pirates off the coast of Somalia into more offensive ones, the creation of the first Chinese platform in 2015 based on the American floating landing platforms (MLP) and the floating supply bases (AFSB), which make the Chinese Navy less dependent on land bases. Finally, measures on the implementation of the Maritime Silk Route project, which can have hidden strategic components. Secondly, the militarization of the region due to the growing number of the navy of the out-of-the-region countries related to both combating piracy as well as strengthening the various interests in this zone (Great Britain, Japan, Germany, the Republic of Korea, the European Union, Russia, etc.). Thirdly, an alarming situation is developing in the South-China Sea at the intersection of the Indian and Pacific Oceans. In this volatile area, there is an ongoing military confrontation between the US Navy and ASEAN on the one side, and China on the other side, which may aggravate after statements by the US President, Donald Trump, on Taiwan, the disapproval of China’s actions in the South-China Sea by him and some members of his administration, and a tough reaction from Beijing. Fourthly, there is a lack of a maritime security structure in the Indian Ocean zone. Nevertheless, there is a trend to discuss this problem within the walls of the Region-wide Association of Indian Ocean Countries’ Cooperation, the Indian Ocean Maritime Symposium and the Galle Dialogue on Maritime Security where India takes the most active positions in order to stabilize the situation. In December 2014, the speech by Indian representative – National Security Advisor, Ajit Doval, at the Gall Dialogue (Sri Lanka), which was attended by 100 delegates from 36 countries, became a landmark. He communicated the fact that for five thousand years, India has been the status quoist country, has and had no intentions to dominate the Indian Ocean. The Republic had always stuck to the principle of free navigation in the region. His message was directed not only against the strategic penetration of China in the Indian Ocean. He urged the strengthening of regional cooperation in order to respond to such challenges as illegal drug traffic, unauthorized movement of people and weapons of mass destruction. Ajit Doval reminded the audience that the coastal countries had acquired the defence capacity potential and had formed several regional structures to keep the maritime order. He also raised a question on the need to withdraw warships of the out-of-the-region countries sent to the Gulf of Aden to combat pirates and return them to their bases. This was a tentative move by India in its quest to find support in the region and the world, to improve its role as an organizer and provider of regional maritime security. It was difficult enough to achieve these goals under the existing naval tandem of India and the USA in the Indian Ocean and the alertness of some countries due to its ambitious program of the naval construction. Will India win support in this ambiguous landscape of their positions, interests, and abilities? At the same time, the other nations recognize that India enjoys several advantages – experience in combating terrorism, piracy, non-traditional threats, the creation of cooperation structures for the maritime security, the growing economy and fleet, international influence, etc. The current meeting under the slogan The New Normal: Multilateralism with Multipolarity is much wider, and in terms of the participants’ composition – more than 250 participants from 65 countries, and the subject of discussions that exceed the scope of the Asian region and the Indian Ocean problems. The participants discussed the fundamental changes in the global system of international relations that took place in 2016, problems with the creation of an efficient security architecture, fighting cyber-attacks, multilateral cooperation, economic integration, environmental protection, women’s role in the community, etc. One of the topical discussion was the impact of Donald Trump’s accession to the White House on issues of peace and security, prospects of US relations with China, Russia, Europe, the future of NATO, globalization and the Trans-Pacific Partnership, etc. Among the speakers at the Dialogue were representatives from the Ministry of Foreign Affairs of India, Nepal, Minister of Foreign and Commonwealth Affairs, Boris Johnson, ex-Prime Ministers of Canada and Australia, S. Harper and K. Rudd, former President of Afghanistan, Hamid Karzai, protocol advisors of the presidents of France, Japan, Bangladesh, well-known flag officers, scientists and public personalities. Russia was represented by the Chairman of the Committee for Education and Science of the Russian State Duma, V. Nikonov, and Executive Director of the BRICS National Committee, G. Toloraya. In the Raisina Dialogue-2017 inauguration speech, Prime Minister N. Modi talked about a wide range of directions and prospects of the Indian foreign policy and reminded the audience about the Indian SAGAR project – Security and Development for All, which was especially vital in the current period of wars, conflicts, and competition of ambition. He also highlighted the need to unite efforts of all the nations on the way to a more stable world, and expressed his strong belief that the Raisina Dialogue forum would take a rightful place alongside the leading security conferences of Munich and Shangri-La that acquired global significance.